Goodrec, from the company by the same name, is now available in the iTunes App Store for the absurdly low price of FREE and is also accessible online at their web site, www.goodrec.com. 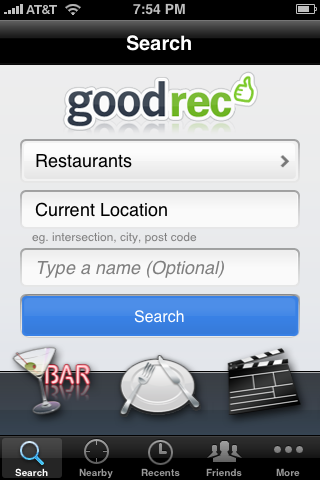 Although there are numerous apps that take advantage of the location-based feature the iPhone offers in order to serve up local eats, treats and other items, Goodrec is worth a hard look and download. Even though it's free, does Goodrec deliver the goods? Is it worth taking up some space on your iPhone, or is it something you'll use a couple times and then banish to the electronic void of deleted apps? Read on for my take on Goodrec! Goodrec is easy to get started with. You can sign up for a free Goodrec account either online at their web site (www.goodrec.com) or right from your iPhone within the app. To sign up, Goodrec only requires your name, email, country, zip code, and a password. Once you set up your account, you are ready to start using Goodrec and sharing recommendations with your friends and the social community. The interface is simple to use. 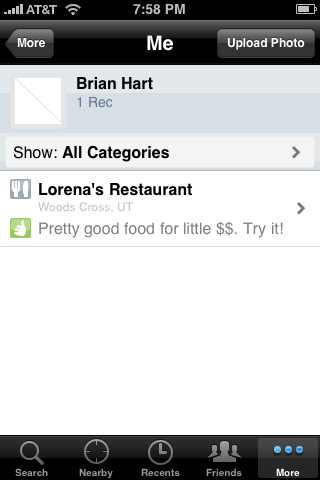 You can use the "Search" screen or "Nearby" to find what you are looking for, from restaurants to movie theaters. Easily look up "Recents" that you have checked before, see which of your friends are online in Goodrec, and even check the history of recommendations you have made over time (more on this in a moment). Goodrec takes up very little memory on your iPhone and offers a simple menu structure to quickly find what you are looking for. Not only can you find it, but the premise of Goodrec is to build in a community of your friends - people whose opinions and recommendations you trust - so you can make better choices because someone else has "been there, done that, ate that." A nice feature of Goodrec is apparent in the name itself - the ability to leave good, bad, or neutral recommendations for a business, including restaurants, bars, books, movies, and anything else for which you spend your hard-earned cash. These recommendations are left by a simple "thumbs up", "thumbs down", or neutral. Recommendations can be made privately, either from your iPhone or from the web site, and you can check out the recommendations of your friends - people you trust - so you have a good idea where your time and money is best spent. 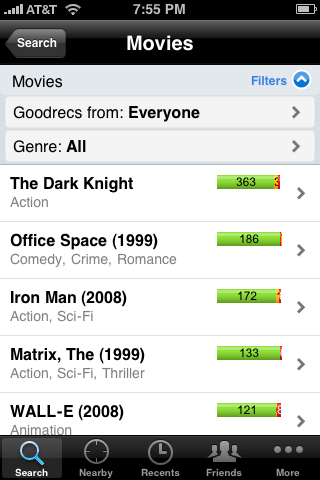 In order to find recommended movies, books, restaurants, etc., you need to use Goodrec's menu. 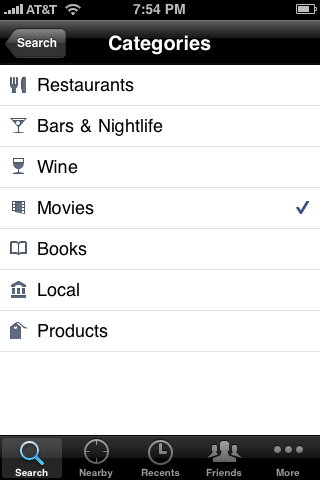 "Search" allows for selecting the category, location, and optionally, a name. If you are more visual, there is a scrolling bar of icons along the bottom of the screen with pictures representing the categories for easy swipe-and-tap. 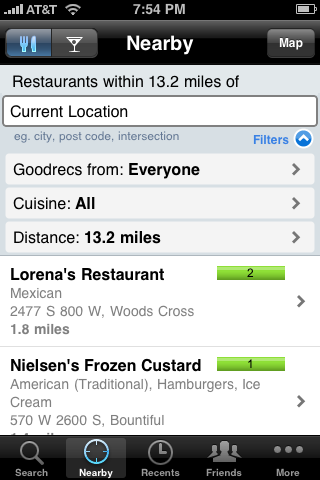 Using "Nearby", you can view establishments represented by a pin on a scrollable map. The scrolling map is an excellent feature which I really like. The map is dynamic, so if your desired destination is just off the edge of the map, just scroll and other businesses will appear with their corresponding pins and names. Tapping on the name will whisk you off to the information screen, including address, phone number, and recommendation. Look up more details here and even pull up a map of the location and get directions. Interestingly, the map on the information is a Yahoo map. Tapping on "Directions" then takes you to the Google Maps app on your iPhone. I really wish the mapping was better integrated in this app so that you don't have to leave the app, check the map, then open the app again to get back to where you were - somewhat of a hassle. The "Recents" tab will, as you might expect, give you a list of your recent searches, including a way to filter categories, sources of Goodrecs, and location. 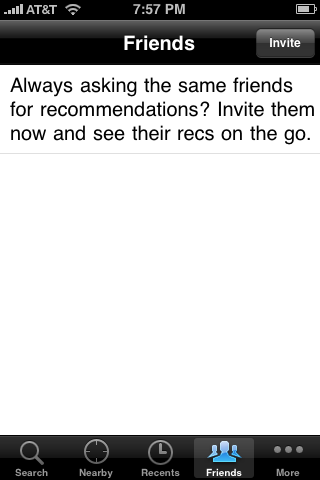 The "Friends" tab keeps a list of your friends and allows you to "Invite" more friends to use the app. 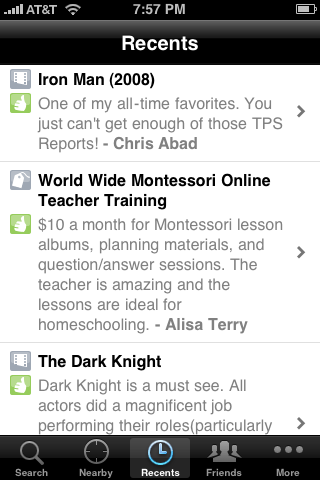 A very nice feature of Goodrec is the social element - you are able to connect with your friends for recommendations. The database you have access to is created by other Goodrec users, so fortunately you won't usually be buried by an avalanche of recommendations when you are looking for something. When you take our turn to recommend something, you will see it immediately appear on the map as soon as you recommend it. While you are there, you can mark the location as "My Location" for easier location reference. Once you give a recommendation, it's stored in the Goodrec database for other people to hopefully benefit from your critique. While you are recommending something, take a picture and store it on your Goodrec so other people can see what you are talking about. If you are a user of social sites like Facebook, Twitter, or friendfeed, you will be happy to know that you can publish your Goodrecs directly on your site for others to read. Goodrec takes advantage of the location-based capabilities of your iPhone and provides a social network of it's own or integration into one of your favorite social networking sites so you can share your recommendations with your friends and others. 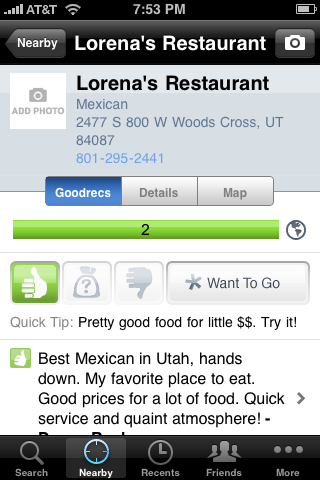 For a free app, Goodrec packs a lot of punch for a location-based recommendation app. The interface is easy to use and well-designed, and features like the dynamic, scrolling map and reviewing recommendations from your friends are huge benefits. It's nice to know that you can go just about anywhere and see what's hot and what's not in your new environment, making it a traveler's friend. The lack of a more seamless mapping experience from app to Google Maps (and the unfortunate multi-step return to the app when you are done with Google Maps) is a drawback, but not enough of a drawback to eliminate how fun and useful this Goodrec is. The recommendation system for Goodrec is simple and effective - thumbs up, down, or neutral, with just enough space to leave a helpful comment or two. The social networking aspect is an excellent way to get trusted recommendations and share your recommendations with your friends. Recommendations can be made quickly, privately, and shared on your social networking sites. 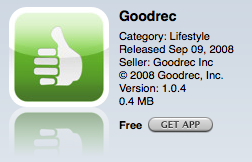 After using Goodrec a few times, it should be an app that stays on your iPhone for a long time. Easy and useful interface for iPhone and web site access. Share recommendations with those you trust - your friends. Dynamic scrolling map and directions support. Somewhat clumsy mapping migration between app and Google Maps. Social network aspect is reliant on update by your could-be-burned out friends.